Oliver Busse has contributed a new project called FileSilo. See below for his description and screenshots. 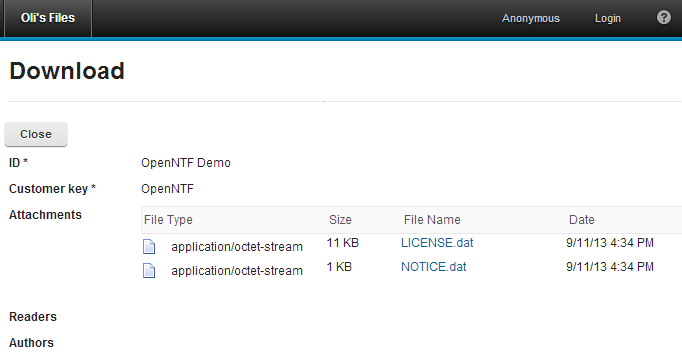 You can also try the application live (key: openntf). "This is a simple XPages application to share files with others without using any login or user management. The access to the downloads is filtered by a customer ID only. You can provide the ID to your customer so he can see his downloads only. In addition you can provide readers and authors fields to restrict internal Notes users when they are logged in. ... Caution: as the documents are not protected by Notes mechanisms but only by filters you should not use this with confidental data but just as a file exchanger."